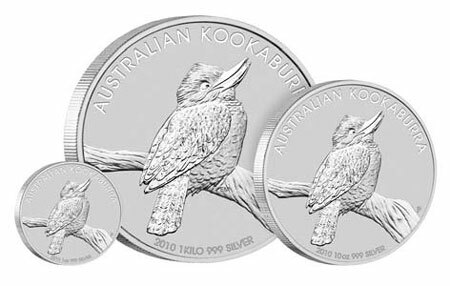 The 2010 Silver Kookaburra was release worldwide on September 1, 2009. It represents the most recent release in the ongoing silver bullion coin series from the Perth Mint in Australia. The series debuted in 1990 and has featured a different image of the distinctive Australian Kookaburra bird ever since. For 2010, the Kookaburra is depicted perched on a tree branch with an upturned beak. The background is plain except for the coin inscriptions. The two tone finish used for the coins creates proof like qualities. The reverse inscriptions include “Australian kookaburra” around the upper rim and the date “2010”, the silver bullion weight, and “.999 silver” around the lower rim. The “P” mint mark appears above the right side of the branch. The obverse of the coin features a portrait of Queen Elizabeth II. Inscriptions read “Elizabeth II”, “Australia”, and the face value of the coin. Under the Australian Currency Act of 1965, the coins are issued as legal tender. The 2010 Australian Silver Kookaburra is issued in three different bullion weights. This includes a 1 kilo coin, 10 ounce coin, and one ounce coin. Only 300,000 of the one ounce coins may be released. Mintage limits do not apply to the other weights.